A snazzy hairdressers' apron is actually quite challenging to find, and having to wear a boring one every day can get pretty lame. How about buying a new apron as a quirky gift for a hairdresser or barber? If your gift is for a colourist, how about a cute colour brush necklace? Or a slightly ruder necklace from Dolly Cool? If you know a lady barber, how about a cut throat necklace? Everyone loves a tote bag right? 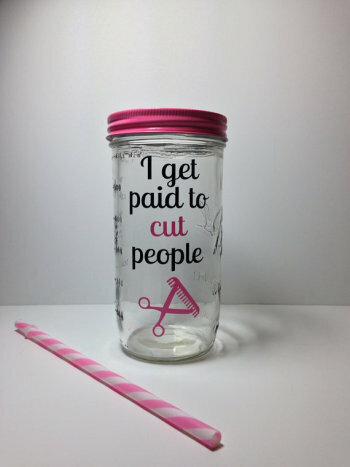 This would be great for a hairstylist. If you're looking for a gift for a gentleman barber, how about a tie? If you know a new hairstylist, this is a sweet gift idea; a business card holder. 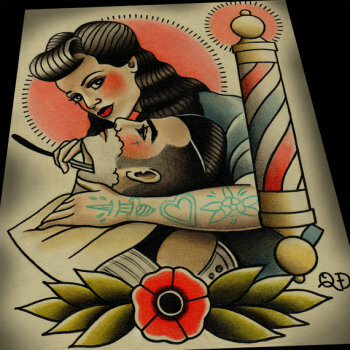 Parlor Tattoo Prints has been an artist on my radar for ages now! She does brilliant barbering art. This is cute and practical - it keeps hairs out of your drink! A fun decal is a perfect secret santa gift for a hairdresser - small and cheap (but unusual).